My name is Mia Beardsley. My Mom started taking me to Venice Dog Beach when I was just 4 months old. She was afraid to let me off the leash, but finally did. Everything was wonderful. I played in the water, chased balls, and met new friends. There is a sandbar at this beach. We swim out to it and then I can stand up!!! Sometimes at high tide I cannot touch the bottom, but Mom can, and she holds me when I get tired. Then we swim back to the beach. During the week, when schools are still in session, Mom and I are often the only ones here. I like that a lot, too. This beach water is tested for bacteria on a regular basis and is usually clean. (We have never found it closed to swimming). 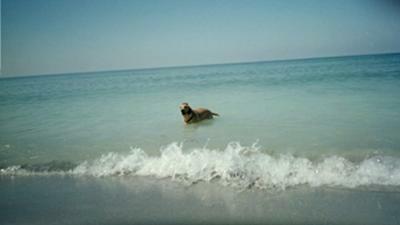 It is about half as long as the dog beach at Fort De Soto Dog Park, and can get quite crowded in the summer. They have 2 small grass areas too that are fenced. Join in and write your own page! It's easy to do. How? Simply click here to return to Dog Friendly Beaches.